What an awesome PR! Congratulations! Nice time!! I was laughing the whole way through reading!! It's funny the things we think about while running :) even more so racing! It's all ok once it's over and done. All WORTH it! BIG Congrats on the PR!!!!! Umm, puking? I love that you actually have a tag for puking, btw! Congrats to you and your daughter! You look so sweet together! Nice job on the PR. For some reason, whether I run a 1/2 or a full I wonder why I am still doing this. This time I was so busy making sure I was maintaining the pace and keeping that dumb sign held up against the wind that I didn't think much about it. awesome PR! love the post! this post is awesome! and yeah...the snow this weekend...not so awesome. where did that even come from. CONGRATS on your race!! I always think about what I am going to write in my blog too...haha. CONGRATS to RACHELLE! she will be so pumped! Yay I am so excited I won!! Way to go on the PR girl!!! That is awesome! I'm sorry you had a pukey tummy though, that is no bueno! 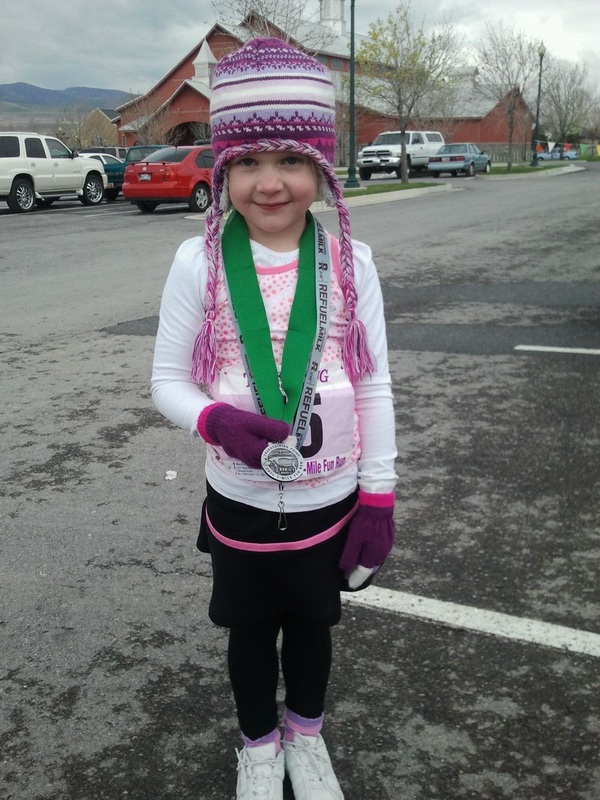 Love the little one's first race pic and medal, she is too cute! Congratulations on your excellent (and hard-earned) PR!!! Congratulations! This is an awesome post - I love it! Thank you. You are an inspiration to me and I will be thinking of your determination and perseverance when I run my first full in two weeks!! Congrats on the PR (even if it did involve puking!). And 14:25 seems really fast for a mile for your daughter - you're going to have a little speedster on your hands!!! CONgrats! PR even with no gels and some puke time? Holy!! Awesome job! And a new PR! That was some wickedly wild weather on Saturday! I hope your toe feels o.k. now. I'm so sorry you threw up. I've had that happen a few times and it's no fun! Such a FUN way to recap. CONGRATS on the PR.. weird about the puking..
Congratulations to you and your princess on the PRs! The puking does not sound like fun. I'm glad that everything turned out alright and that you smiled a lot! 3 - The first digit of your future marathon PR. If you're knocking out sub-2 HM's, it's only a matter of time! Just maybe avoid those delicious cranberries. 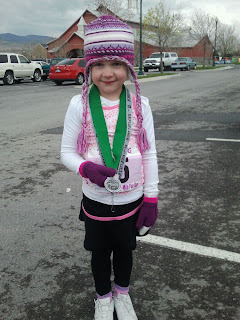 And your Princess is a superstar, both for her finishing time and that hat. Love your re-cap! I was at the Thanksgiving Point Half too!! I LOVE this half. My absolute favorite. I was much, much slower than you as I was coming off some injuries and sickness, but I had a wonderful time nonetheless. Congrats to your Princess too!